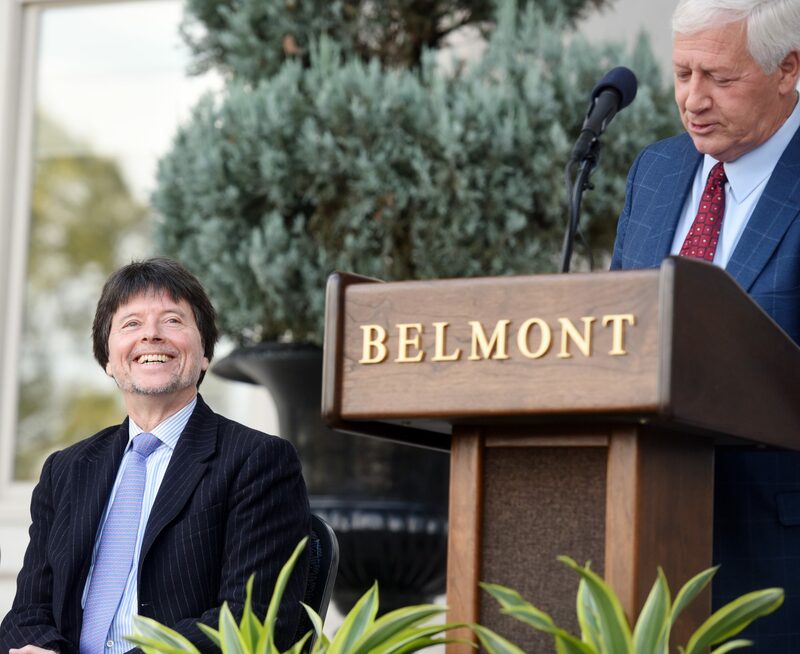 Ken Burns speaks to students as Belmont University announces major sponsorship of Ken BurnsÕs new documentary, the highly anticipated ÒCountry MusicÓ which is slated to premiere nationally on PBS in 2019. Baseball. The Civil War. Jazz. The National Parks. The list of subjects covered by Emmy Award-winning documentarian Ken Burns reflects the heart of American culture and history. Now, Belmont University has agreed to partner with Burns on the latest addition in his iconic career, the highly anticipated “Country Music,” slated to premiere nationally on PBS in 2019. The Belmont grant will help underwrite a portion of the production and distribution costs for the anticipated 16-hour series, while also securing significant educational benefits for Belmont students along with national exposure for the University. 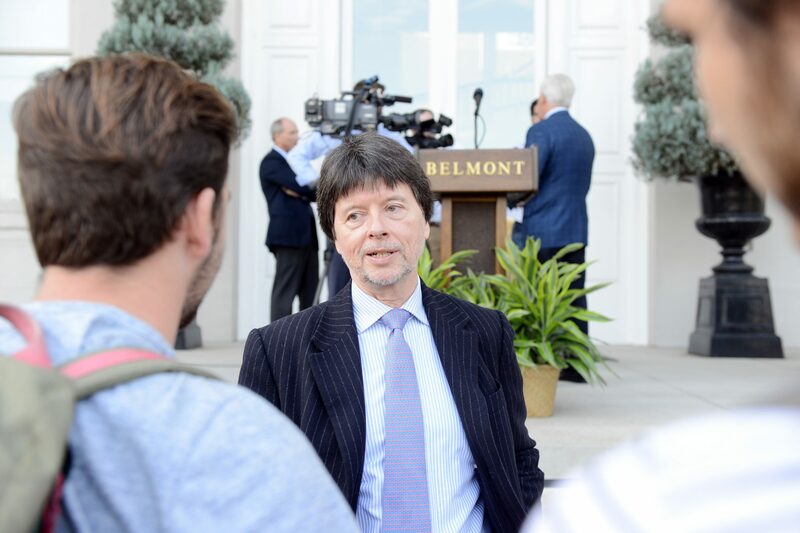 Dr. Fisher speaks as Belmont University announces major sponsorship of Ken Burns’s new documentary, the highly anticipated ‘Country Music’ which is slated to premiere nationally on PBS in 2019, on the front steps of Freeman Hall at Belmont University in Nashville, Tenn. November 2, 2016. As part of the partnership, Belmont will have the opportunity to host a private screening for an episode of the series on campus along with a Q&A session for students and faculty with Burns. In addition, select Belmont students and faculty will be invited to visit Burns’s Florentine Films editing facility in New Hampshire to view portions of the work-in-progress. Starting next year, Belmont students will intern with Florentine Films in their New Hampshire or New York offices. The sponsorship will also deliver tens of millions of impressions for the Belmont University brand upon its broadcast on PBS, along with its presence on the website, home video packaging and promotional materials for the series. Directed and produced by Ken Burns and written and produced by Dayton Duncan, “Country Music” will chronicle the history of a uniquely American art form. From southern Appalachia and the Ozark’s songs of struggle, heartbreak and faith to the rollicking western swing of Texas, from California honky tonks to Nashville’s Grand Ole Opry, the series will follow the evolution of country music over the course of the twentieth century, as it eventually emerged to become America’s music. The series will also chronicle the rise of Nashville–with its songwriters and musicians, its publishers and its studios on Music Row–as not just the home of Country Music, but Music City USA. Belmont will be the only University or college to partner with Florentine Films as a sponsor on this project, and the pairing makes good sense with nearly a third of Belmont students currently studying music or the music/entertainment industry. Home to alumni Brad Paisley, Trisha Yearwood, Josh Turner, Brandy Clark and Florida Georgia Line and numerous others, Belmont has earned a longstanding and well-deserved reputation as an incubator of country music talent. In addition, countless award-winning songwriters, producers, engineers and industry executives began their careers at Belmont University, including Ashley Gorley (27 No. 1 singles), Universal Music Group President Cindy Mabe, Big Machine Records Vice President John Zarling, Warner/Chappell Executive Vice President Ben Vaughn and acclaimed producers Mark Bright and Mark Wright, among countless others. Belmont’s Curb College of Entertainment and Music Business was recently recognized by Billboard as an “Elite Music Business School,” and the University’s School of Music is consistently lauded as one of the nation’s best commercial music programs. Faculty in both areas represent immense expertise and experience in music of all genres, including country, with such names as violinist Tammy Rogers King (SteelDrivers), bassist Viktor Krauss (Lyle Lovett), Turtles’ co-founder Mark Volman and engineer Joe Baldridge (Taylor Swift), teaching Belmont students daily.